Mix all ingredients, drop by spoonfuls and bake for 22 minutes at 325°. You might be able to see the issues I’d have with this recipe, but just in case you can’t…. It’s full of red dye. It’s full of high fructose corn syrup. But, the combination of cherries, almonds and coconut is a favorite flavor profile of mine. Time for a recipe makeover! I’m fairly happy with the results, though I think that next time I do it, I’m going to use finely shredded coconut, instead of the flaked variety. I’m not keen on the flaked texture after all this time eating the shredded kind. The best part of this recipe, though, is that it was the impetus for making home made sweetened condensed coconut milk – something I’ve been meaning to try for a while. And, you know what? It rocks! 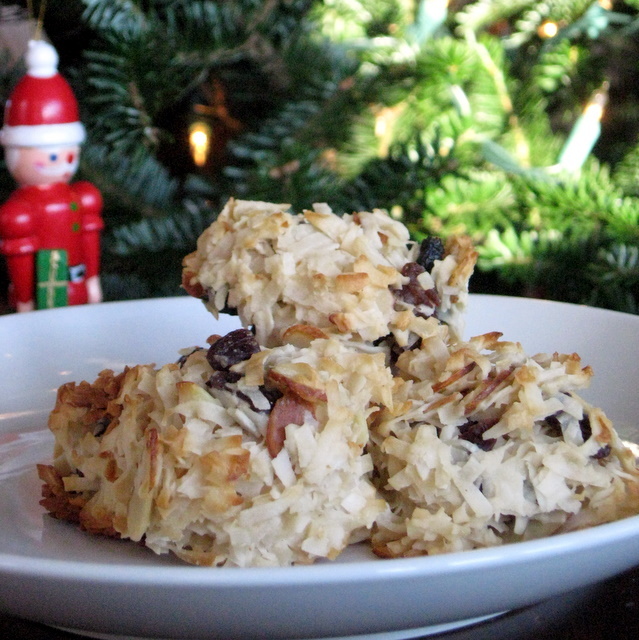 So, bonus 3 in 1 recipe post today, the traditional cookie, the new and improved healthier cookie, and the “ingredient within” recipe. Preheat oven to 325°. Mix all ingredients together. Scoop small mounds with a cookie or small ice cream scoop. It works best if you pack it together a bit. Bake for 15 minutes, or until edges are golden and crispy. Combine both ingredients in a heavy bottomed saucepan and place over lowest heat possible. Simmer gently until reduced to 1 cup and darkened in color. Be patient, this takes a long time – over an hour for me. But, it’s worth it and it will make your house smell simply amazing! For more slightly indulgent recipes, check out Slightly Indulgent Tuesdays. For more gluten-free goodies, check out Gluten Free Wednesdays. 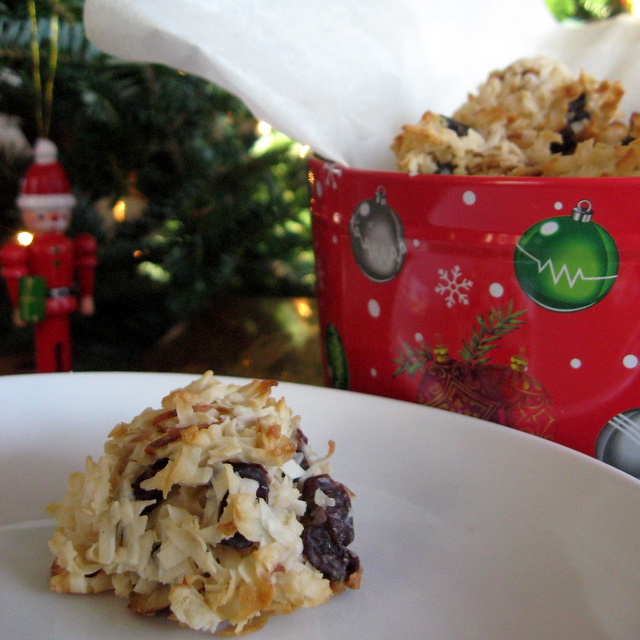 This entry was posted in coconut, cookies, grain-free, holiday, nuts, vegan and tagged almond, cherry, Christmas, coconut, cookie, grain-free, vegan. Bookmark the permalink. Thanks for the vegan sweetened condensed milk recipe! Very useful. Hope you have a wonderful holiday, Deanna! Thanks, Maggie. No, he won’t try them because I brought them to a potluck and they mostly got gobbled up. There aren’t enough left to haul out to Arizona with me for Xmas. Besides, my mom made the version he likes. He’s tried other stuff I’ve made, though – like the peanut butter peck cookies and the chocolate crinkles. Google really deserves some credit for giving me the link to your blog. I’m trying to cut the dairy usage in our home, and this is a great way, along with an amazing recipe. I especially adore your recipe for homemade sweetened & condensed coconut milk. Up until a year ago I used to buy the regular kind, but it finally got to me that the product is not natural, and the idea of cow milk going through that procedure became quite disgusting to me. This coconut sweet milk is SO delicious I wanted to drink it! Haven’t tried the cookies yet (they’re in the oven) I used finely shredded coconut. Hope the cookies turn out for you. Let me know how they work with the finely shredded coconut. I’m pretty sure they’ll be better than with the flaked. Deanna! I love this re-make! What a brilliant and healthier twist on these! I think my kids would have a blast making these with me!! Yum! Cherry, coconut and almond is one of my favourite combinations too – although coconut and I don’t get on that well, so I tend to use the milk and oil rather than the flesh. I wonder if these would work with flaked almonds in place of the coconut shreds? Dried cherries are so delicious too! Why would anyone even bother with the glacé kind? I’m not sure if flaked almonds would work or not. It’s worth a try, right? MMMMM,..I love both versions!! And home made dairy free condensed milk,..this is awesome too! From now on, I too can enjoy condensed milk!!! These look absolutely delicious! What a perfect, little treat! I realise this is an old recipe but I hope you’re still checking the comments. I was wondering if you know how much the coconut milk reduces exactly? I don’t know the volume of the can you used. I’m hoping it goes from about 1.5 cups to 1? I’m also hoping that I can use this coconut condensed milk in other recipes in place of dairy – it sounds like it’d be particularly good in a lime pie, mmm. I’ve not used it in other recipes, but I bet you could. Lime pie sounds yummy!